I picked up Elizabeth after work the other day only to find her with two skinned knees, a skinned elbow, scratched palms, scraped ankles, and cheeks rosy with the beginning of a sunburn. 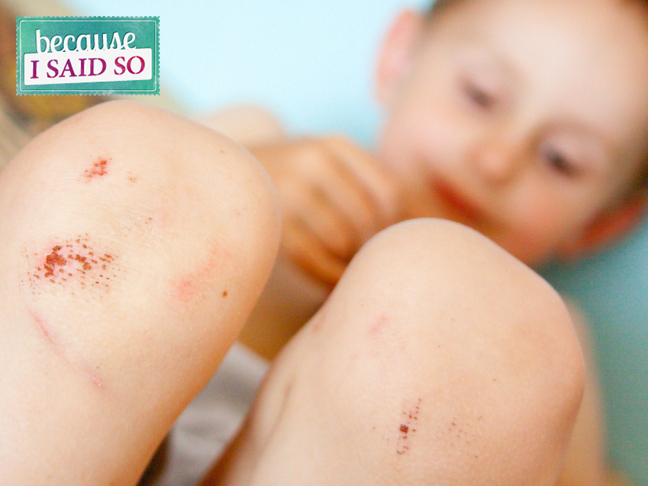 “What did you do?” I asked her, horrified at the number of band aids covering her pale arms and legs. “I played!” she explained as she ran off, nearly tripping before she made it to the car. She paused at the bumper and climbed a low rock, jumping off into the dry grass lining the driveway. I don’t remember the last time I had a skinned knee. It’s been years and when it happened, it not only bled, but bruised. I wish I could say I was more graceful as an adult than I was as a kid. I think the sad truth is I don’t play as hard. I’m more of a sewing and gardening gal than a mountain biking and rock climbing chick. I like my hiking trails to be appropriate for the under four set and my other outdoor adventures to be completed with appropriate helmets and kneepads. Joseph takes after me: cautious and calm. We both study a trail, eye a climbing tree, and make sure we’re in a secure position before leaping. We quieter in our activities than Elizabeth. We like to read and play games and garden. Elizabeth tosses caution to the wind and pushes both Joseph and I to jump higher, climb further, and play harder. I can only hope she absorbs some of our thinking before leaping, to help prevent too many skinned knees.